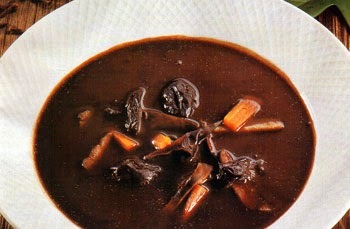 Polish Classic Cooking: Duck Blood Soup (Czarnina) …One More Time! 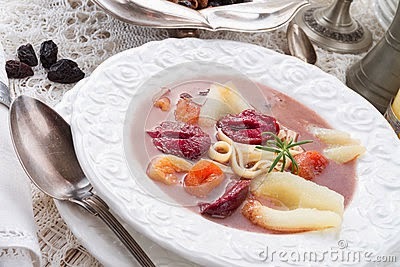 Duck Blood Soup (Czarnina) …One More Time! Witamy! This Blog has been on the web for almost four years and this is our 100th post. 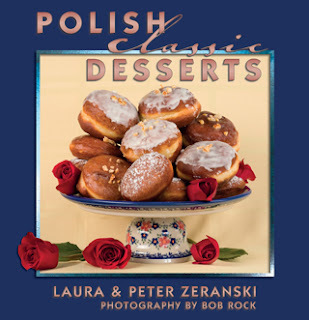 During that time, and during all of the visits we have made to Polish Heritage Festivals, the most frequently asked questions revolve around Czarnina – the classic Polish Duck Blood Soup. So many folks remember it from their childhood and this is one dish that you either love or hate – there’s no in between. Over the years Czarnina has become one of legendary memories that grows with age (just like that huge fish that got away) but I suspect the legend has overshadowed the actual taste…duck’s blood?? Really? Even though I can’t get my head (or taste buds) comfortable with the notion of sipping the blood of a duck, even cooked, we would have included it in our book, if the ingredients were easier to find. I called our favorite butcher and was told that fresh ducks were readily available, but only cleaned and dressed. I checked in the local international grocery stores, and found frozen cow’s blood but no duck blood. With all the regulations on commercial food handling, I’m guessing that no one will guarantee the freshness and safety of the blood. I suppose one could get fresh blood directly from a farmer...if one knew a farmer…but I don’t. A couple of years ago we posted this recipe for “mock” Czarnina which was adapted from a very old traditional recipe and it generated a lot of hits on this website. So we’re posting it again for your pleasure and culinary enjoyment. The recipe avoids real duck blood but it still gets a lot of flavor from prunes and from fresh or smoked neck bones, either pork or some variety of fowl – whatever you can get. Try it and let us know how it worked. · 3 pounds meaty fresh or smoked neck bones, pork, turkey, duck, etc. 1. If using fresh neck bones, blanch, drain and rinse them. Place blanched or smoked neck bones in a large pot or Dutch oven. Cover with water. Bring to a boil, skimming off any foam that rises to the top. 2. While the bones are coming to a boil, make a small bag from cheese cloth (or a clean cotton hankie) and place in it the celery, parsley, allspice and cloves. Add it to the soup pot, reduce heat, add vinegar and bay leaf and simmer, partially covered, for 1 hour. 3. Add prunes and season slowly with sugar, salt and pepper (go easy on the salt if using smoked neck bones). Bring back to a boil, reduce heat and simmer slowly, partially covered, for 1 hour or until meat falls off the bone. Remove the neck bones from the pot. 4. Taste again and adjust the seasonings, plus vinegar or lemon juice, to your own palate. Add the seasonings slowly, and keep tasting. The broth should have a slightly sweet note from the plums and sugar, but with a soft contrasting tartness from the vinegar or lemon juice. Remove meat from bones and return the meat to the pot. 5. Turn off the heat, cool soup and then refrigerate until fat is congealed on top for easy skimming and removal. 6. Just before serving, in a medium bowl, “cream” the cold soup by adding a few ladles of cold soup and slowly whisking in the flour and cream; and whisking (or blending) until very smooth and all the flour lumps are gone. Pour this mixture back into the soup pot and heat gently until soup is thickened and any raw flour taste is cooked out. Serve over noodles, if desired. Smacznego! PS: there are several regional versions that make great use of fruit in the soup. Pictured is one such version with pears and fresh plums. I make a similar version, except I use a whole duck and pork spare ribs. I prep the broth the day before so that I can strain off the fat the next day. The pork ribs are kept for a barbecue sandwich and the duck meat comes off the bones and is returned to the broth. I also use a couple of teaspoons of Kitchen Bouquet seasoning to make the color richer.